The first church for this congregation is thought to have been built around 1785 at a site near the intersection of U.S. 17 and Garrett Road (about a half mile from this building). The congregation grew to the point that the structure had to be enlarged in 1788. Groups of the member-ship were dismissed to form congregations at Smithwick’s Creek and Tranter’s Creek (Pitt County) in 1803. In 1804 a group was sent to the newly formed Conoho Log Chapel. The congregation continued its growth necessitating the erection of a much larger building in 1827 which was presumed to be located not far from this present structure. In 1857, Joseph d. Biggs, who lived across the road from this building, gave two acres of land for the new church. In return, Biggs was given the old church site and any timbers from the old building that were not needed for the new construction. In October of 1857, with half the funds needed for construction in hand, the work on this building began. The final cost was placed at $1,784.12. 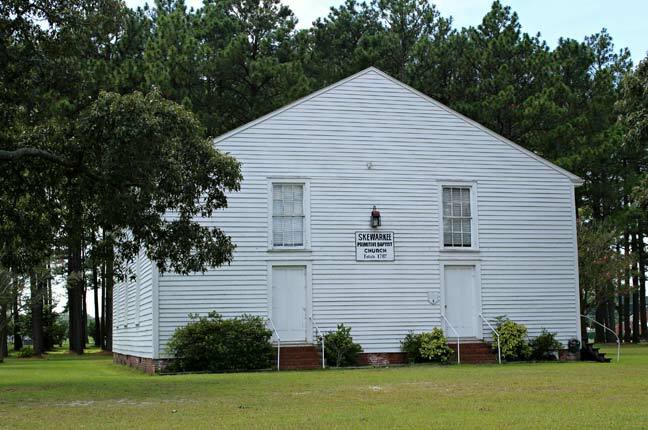 Skewarkey Primitive Baptist Church has been an integral part of the Primitive Baptist organization in our part of the state. Cushing Biggs Hassell (1809 – 1880) served as pastor from 1842 until 1876 and was considered by many as the denomination’s leading preacher between 1850 and 1880. He served as moderator of the Kehukee Association, the nation’s oldest Primitive Baptist Association from 1859 until his death. His residence at 138 West Church Street in Williamston is one of the county’s Greek Revival landmarks. Note the balcony in the picture to the right. Slaves and freed African-Americans also attended the services. 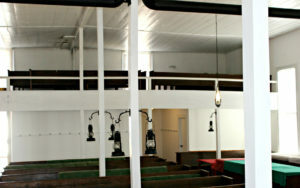 There are five such balconies located in the Primitive Baptist churches.